Dreambuilder Custom Homes is pleased to announce the completion of Dreambuilder Eight: a kitchen transformation for the Schneider family in Jacksonville, FL. Kirsten Schneider is a professional chef and owner of Dinners Direct, a home-delivery meal preparation service. Her current kitchen, original to the 25-year-old home, fell woefully short of her needs, both in function and style. The new kitchen features all-wood, raised-panel, full-overlay cabinetry with rope inlay and finished in a hazelnut glaze. The rich warm finish is the current trend in today’s kitchen colors. Beautiful granite countertops and a gorgeous glass mosaic tile backsplash bring luxurious touches to Kirsten’s new kitchen. 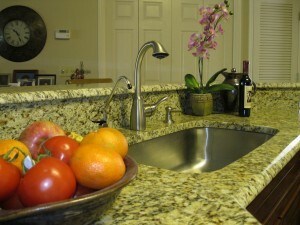 Dreambuilder added a stainless steel undermount sink with coordinating Moen faucet. 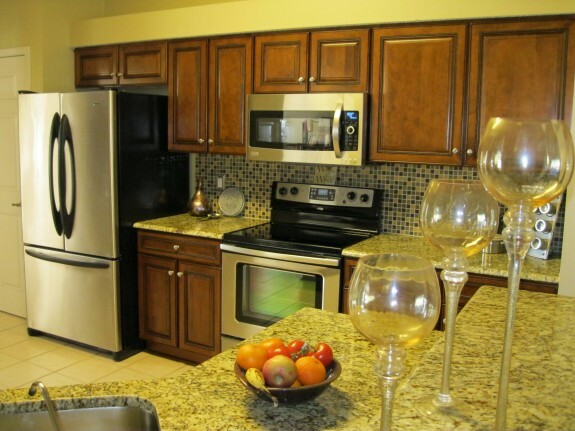 New stainless steel appliances and fresh paint complete the new look. “I hired Shawn and Dreambuilder to remodel our kitchen in December 2010. I am thrilled with the result and absolutely love the new look!” Kirsten said. The original kitchen was full of low-grade oak cabinetry and unattractive laminate tops, as well as a non-functional desk area that existed simply to hold the countertop microwave oven. Dreambuilder and its team of professional designers worked with Kirsten to create a kitchen that was not only updated in style but also in function by adding additional cabinetry and drawers. A built-in microwave/hood over the new range freed up additional counterspace as well. Additionally, since the project took place between the Thanksgiving and Christmas holidays, time was of the essence to minimize the time it took to complete the project. And, at a time of year when we think of others less fortunate, Kirsten’s old cabinetry was donated to the Habijax ReStore. Dreambuilder has been a supporter of Habijax and was happy to arrange the donation.